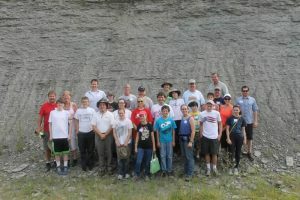 Designed for budding paleontologists age 12 – 16, this camp focuses on the how to become a paleontologist through activities and field work. Limited to 10 budding paleontologists. Call 812-283-4999 to reserve your space. This camp fills up every year! 2018 participants were from Wisconsin, California, Iowa, Illinois, Indiana, Missouri, and Ohio. Participants will experience the life of a paleontologist – everything from field collecting and cleaning fossils to studying and photographing fossils to writing in a field note book throughout the camp. During field collecting, participants will be able to keep what they find. 1) Children are between 12 – 16 years old as of July 1. 2) Parent, grandparent or legal guardian will agree to actively participate with the child for the duration of the camp. 3) Child must have a interest in fossils for at least 2 years prior to this camp. 4) Prefer that child has a career goal in paleontology and/or has their own fossil collection. Priority will be given to first-time participants. Limit to 10 child / adult pairs. As you might gather, this “career camp” is not geared for those without a serious interest in fossils! Click here for a look at the three-day itinerary. Children will be accepted only with actively engaged adults. For anyone interested in paleontology. This camp will include collecting tips, fossil identification, hands-on activities and resources.